You did everything right when you launched your customer reference program – you ensured that you had buy-in from sales, you held a high-profile launch event and you developed a clear, comprehensive process to manage all related project flow. So now it’s time to sit back, relax, and watch the reference cases roll in – isn’t it? Well, not really. The truth is that even with all the right elements in place at the start of your program, you still need significant hands-on management to make sure your program stays up-and-running and organized after the initial customer reference launch. Without a strong hand to guide it, it’s easy for a customer reference program to lose momentum. Sales, your most important source for customer leads, has plenty of other priorities. If you’re not promoting the benefits of the program to sales on an ongoing basis, it will fall to the end of the task list. And it’s easy to get bogged down by the challenges of following up with customers in all the countries where your organization is active, as well as finding local writers and photographers. But there are lots of ways that you can keep the ball rolling on your customer reference program, and continue to strengthen the program infrastructure so that your program remains active for the long term. Figure out how you’re going to involve and reward your sales force. They are the users, but also your most important source of customer reference stories. You need to get initial buy-in and also find ways to keep them involved. Prepare writing guidelines for a standardized approach with external collaborators and translators. Make sure the international photographers get strict photography and video guidelines. Create an online workflow hub for the use of everyone involved in generating customer references. This will give you an instant overview of the status of all cases, and will minimize excessive e-mails and streamline the workflow. Consider working with a partner to manage your customer reference program. There are marketing agencies that specialize in managing customer reference programs for their customers, and have the expertise, knowledge and processes already in place that will ensure success for your program. 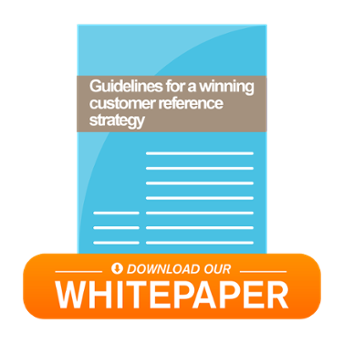 Do you like to learn more about keeping the ball rolling on your customer reference program?